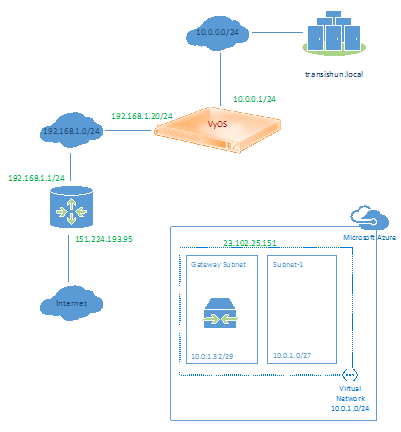 In this, part 3 of the series, we’ll implement the configuration required for VyOS to enable it to become a VPN endpoint with which we can connect to our Azure Virtual Network Gateway to form our Site-to-Site VPN. If you still haven’t, consider reading part 1 and part 2 of this series to provide the background of our modest network and how we configure Azure to create its side of the VPN cross-premises connection. As a reminder, our network configuration looks as follows (no tunnel and no Azure VM yet). Now, if you’ve arrived here expecting a rundown of what a Site-to-Site VPN connection is, IPSec, IKE/ISAKMP, AH, Phase 1, Diffie-Hellman, proposals etc. then you’re likely to be disappointed. There’s little point in me covering old ground re-explaining what is already covered very nicely by people far better qualified than I am. If you’re interested in reading about those subjects, obtain the Vyatta documentation (remember, VyOS is a fork of Vyatta!) on VPN and give it a read. This Rackspace website provides a link to the Vyatta 6.5R1 documentation. As mentioned, I’m not going to go over old ground but I will give you the required configuration commands to set up the Site-to-Site connection in VyOS. Of course, these commands are relevant to my local and the Azure virtual networks that I created in part 2 so should be adjusted. 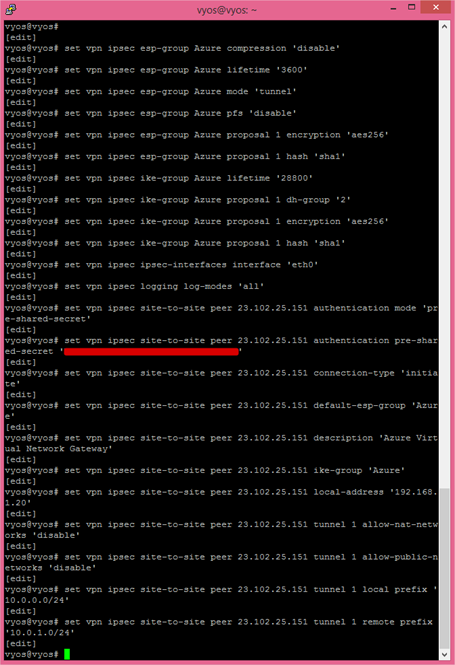 I’ve also called out where the Azure Virtual Network Gateway IP address (highlighted red) and Shared Key are used. 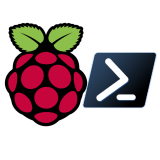 First, assuming you’ve installed and configured VyOS as per your own network – access it from the console or, if you’ve configured SSH access like I have, access it from there and enter configure mode. to include your Azure Network Gateway IP, shared key and appropriate other information such as the IP of the VyOS router and local and remote subnets. We obtained these during part 2 when the Virtual Network Gateway was created. Once executed, the screen should look something like this. Before the configuration will take, it must be committed. 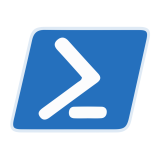 Type commit at the command line now then navigate to the Azure portal > Networks and open the dashboard for the Virtual Network. Initially you’re likely to see the following image showing that the VPN is attempting to connect. Now that the configuration is committed on your VyOS software router, assuming all of the pre-requisites as discussed in part 1 are in place, including appropriate port forwards in your edge router, the cross-premises Site-to-Site connection should form up and the Site-to-Site tunnel will connect, like so. For completeness, I’ve included my VyOS router’s entire configuration below. Notice there is no NATing done anywhere. 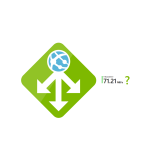 description "Azure Virtual Network Gateway"